"40 Years of Failure to accept that Iranians will never return to submission. 40 Years of Failure to adjust US policy to reality. 40 Years of Failure to destabilize Iran through blood & treasure," FM Zarif wrote in a tweet on Tuesday. In one tweet, Bolton pledged the US' support to the Iranian people, who he claimed should "determine the direction of their country" after "40 years of failure". In July 2017, Bolton told an MEK gathering convention that "the outcome of the president’s policy review should be to determine that the Ayatollah Khomeini's 1979 revolution will not last until its 40th birthday". "The behaviour and the objectives of the regime are not going to change and, therefore, the only solution is to change the regime itself. And that’s why, before 2019, we here will celebrate in Tehran!" he claimed. — Sharmine Narwani (@snarwani) 11 февраля 2019 г. The US officially removed MEK, which describes itself as the biggest rival to the ruling Islamic Republic authorities, from its terrorism blacklist in 2012. 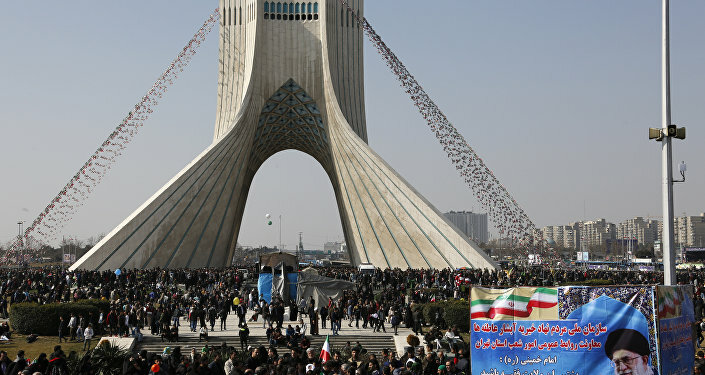 11 February 2018 marked the 40 anniversary of the Iranian Revolution, during which guerrillas and rebel forces led by Ayatollah Ruhollah Khomeini overwhelmed troops loyal to US-backed ruler Mohammad Reza Shah Pahlavi in street clashes in the Iranian capital.